Ernest Hemingway’s early adulthood (1917–1929) was marked by his work as a journalist, wartime service, marriage, conflicts with parents, expatriation, artistic struggle, and spectacular success. 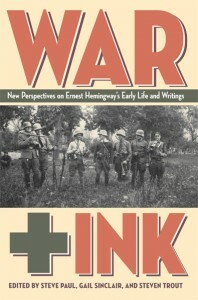 In War + Ink, veteran and emerging Hemingway scholars, alongside experts in related fields, present pathbreaking research that provides important insights into this period of Hemingway’s life. Comprised of sixteen elegantly written essays, War + Ink revisits Hemingway’s formative experiences as a cub reporter in Kansas City. It establishes a fresh set of contexts for his Italian adventure in 1918 and his novels and short stories of the 1920s, offers some provocative reflections on his fiction and the issue of truth-telling in war literature, and reexamines his later career in terms of themes, issues, or places tied to his early life. The essays vary in methodology, theoretical assumptions, and scope; what they share is an eagerness to question—and to look beyond—truisms that have long prevailed in Hemingway scholarship. Highlights include historian Jennifer Keene’s persuasive analysis of Hemingway as a “typical doughboy,” Ellen Andrew Knodt’s unearthing of “Hemingwayesque” language spread throughout the correspondence penned by his World War I contemporaries, Susan Beegel’s account of the 1918 Spanish Flu Pandemic and its previously unrecognized impact on the young Hemingway, Jennifer Haytock’s adroit analysis of “destructive spectatorship” in The Sun Also Rises, Mark Cirino’s groundbreaking discussion of the instantaneous “life review” experienced by Hemingway’s dying characters (an intrusion of the speculative and the fantastic into fiction better known for its hard surfaces and harsh truths), and Matthew Nickel’s detailed interpretation of the significance of Kansas City in Across the River and Into the Trees. A trio of scholars—Celia Kingsbury, William Blazek, and Daryl Palmer—focus on “Soldier’s Home,” offering three very different readings of this quintessential narrative of an American soldier’s homecoming. Finally, Dan Clayton and Thomas G. Bowie reexamine Hemingway’s war stories in light of those told by today’s veterans. War + Ink offers a cross section of today’s Hemingway scholarship at its best—and reintroduces us to a young Hemingway we only thought we knew. EditorsSteve Paul is senior writer and arts editor at the Kansas City Star, Ernest Hemingway’s first newspaper. Gail Sinclair is executive director and Scholar in Residence of the Winter Park Institute at Rollins College. Steven Trout chairs the Department of English at the University of South Alabama in Mobile. ReviewsWar + Ink is reviewed in the Fall 2104 issue of The Hemingway Review. This link to the review is viewable only to Project MUSE subscribers.